Disney’s Typhoon Lagoon celebrated its 25th anniversary on June 1 with a special all-day party. The party featured a DJ on the Clock Tower, cupcakes, and specialty beverages. The water park also introduced two new waffle sandwiches – a savory fried chicken sandwich and a sweet chocolate chip waffle with fruit and cinnamon sugar. Both sandwiches are available through August 1. Typhoon Lagoon opened June 1, 1989 boasting the largest wave pool in North America, in addition to storm-themed water slides, and a kids’ area. The park is home to Walt Disney World’s first water coaster, Crush ‘N’ Gusher, which opened in 2005. 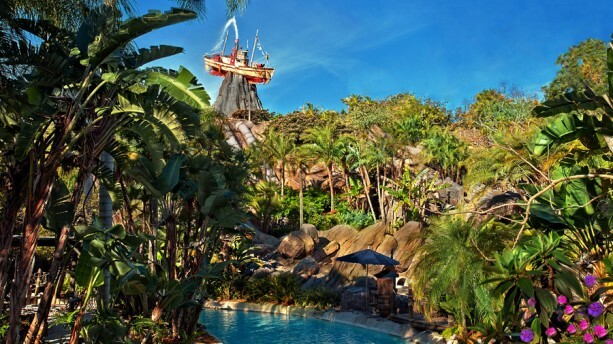 Typhoon Lagoon also offers guests a chance to snorkel in Shark Reef, a 362,000 gallon salt water tank where sharks, stingrays, and other fish. Guests can also take in-park surf lessons in the Surf Pool.